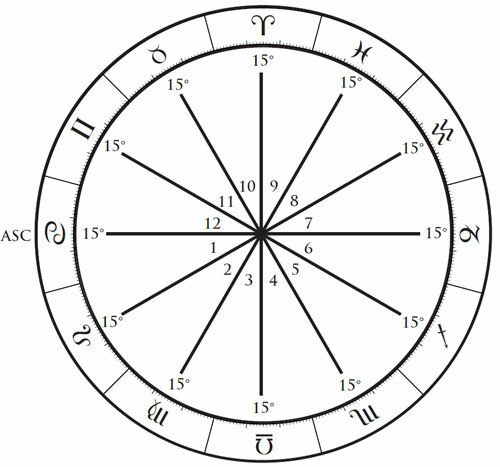 The equal house system is a method of house division that divides each of the twelve houses into equal thirty degree segments starting from the degree of the ascendant. It is usually referred to as “equal houses” or the “equal house system”. 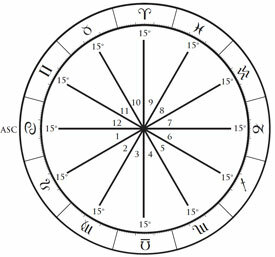 In the equal house system the cusp or starting point of each house will always be in the same degree of each sign as the ascendant is in the rising sign. In the example to the right the ascendant is located at 15 Cancer, and so the area from 15 Cancer to 15 Leo becomes the first house. Then the area from 15 Leo to 15 Virgo becomes the second house. 15 Virgo to 15 Libra becomes the third house, and so on. Equal houses is one of the few systems of house division in which the degree of the MC floats freely in the top half of the chart, and does not mark the cusp or starting point of the 10th house. Instead, in this system the 10th house always begins exactly 90 degrees before the ascendant. The equal house system is sometimes confused with whole sign houses, although the two approaches usually produce quite different results. Equal houses is one of the oldest forms of house division, with evidence for its usage dating back to the 1st and 2nd centuries CE. However, it is not the oldest form of house division, since there is evidence for the use of whole sign houses from the 1st century BCE.